Failing to get a Rand McNally Map of Utah, I have not plotted these locations. The good news is that the Mormon Trail is followed by modern highway (for the most part). Take the side road down Echo Canyon and stay on it to Henefer. Turn left and go up and over to East Canyon, where the original trail is covered by the water of the reservoir (I went water-skiing there once and it just didn't feel quite right boating over a drowned pioneer trail). Then follow over to Little Mountain and Big Mountain where the original trail still exists just a ways to the south of the highway. Stop at the top of Big Mountain for the first views of the valley as this is the right place, and drive on down Emigration Canyon to This Is the Place Monument. The monument is free, it costs a bit to visit the pioneer village which is really cool, but you can get in for free if invited to special events like family reunions. The Heber C. Kimball Family Reunion is a hoot because you will run into people you never knew your wife is related to as there are thousands of his descendants. But the important thing is that Elinor Jenkins Vaughan (age 68 - approximate), Jane Vaughan Lewis (age 29), John Lewis (age 33), and John Samuel Lewis (age 8) made it! See the Ellswoth Company info here. For earlier portions of the journey, see Iowa, Nebraska, and Wyoming segments. And join in celebrating the entrance into the Valley of blessed, honored pioneers! The camp rolled out at 12 P.M. and Travelled 18 miles[.] the road was pretty good. We forded the Weber about 1 P.M. and had dinner in the Weber banks[.] camped about 30 past 6 P.M. Wood, water and feed plenty. We were visitted by a few Indians. (Galloway OTD). T. 23rd Came 21 mi and camped on E Kanyon Creek (Oakley OTD). The camp rolled out at 7 A.M. and travelled 20 miles. the roads were rather rough and rugged. camped about 30 past 6 P.M. Wood, Water and feed plenty. (Galloway OTD). Wed. 24th Came through E Kanyon Creek and over the big mountain and camped at the foot of the last mountain. I had to go back 3 mi. in the dark to look for one of the teams and waggon and felt all the time that some one might have to come to look after me for I was much exhausted through the severe toil of the day—my head was dizzy. I found the team and waggon full of passengers waiting[.] the teamster taken sick so I told them to pray and I would do the best I could in threading through the dark Kanyon which I did but am sensible not without much assistance from an unseen source[.] 10 o.c. came in Camp (Oakley OTD). The camped rolled out at 7 A.M. and Travelled 20 miles. crossed Kanyon 11 Times. the roads a little rough[.] had dinner at the bottom of the bigg mountain. Crossed the bigg Mountain in 2 hours and 55 minutes[.] camped at the foot of the little Mountain at 6 P.M. (Galloway OTD). 25 travelled 25 miles found it tight work to Pull our carts up the Big Mountain but realized the Promise that as thy Day thy strength shall be[.] Brother Lyne 26 came to meet us from the valley (Ham OTD). The night we were encamped on Little Mountain the McArthur company again overtook us. There was general rejoicing in all hearts. Early the next morning bread, beef and coffee arrived from Salt Lake City. That very morning we passed a wagon company that had said goodbye to us in Iowa. I had acquaintances in this company who had said “We will beat you into Salt Lake City.” I now had the pleasure of passing them. The men took off their hats and cheered. (Sabin OTD). The Brethren from the city sent us a waggon with provisions as we were rather short. At 30 past 10 A.M. the camp rolled and Travelled 13 miles[.] about 8 miles from the city we were met with Governor Young and his counsellors, the Nauvoo brass band, the [Lar...s] and a great many others[.] we were first rate received in the city[.] Provisions of all kinds came rolling into to us in camp. the brethren of the city manifested great enterest towards us as a company. which caused our hearts to rejoice and be glad. A Galloway, Secretary (Galloway OTD). we laid down our Hand carts on union square 16 ward[,] Salt Lake City[,] sep 26[,] 1856 (Ham OTD). Fri. 26th Some good and wholesome provisions were brought us from G. S. L. City. we could hardly realize it was so. As we came down the little mountain we saw a great company from the city who had come to meet us and bid us welcome. Prest B[righam] Young, H[eber] C. Kimball and others of the heads of Israel among them to thus highly and distinguishingly honour us for I think no Com. was ever met thus far up the mountains before. I feelt that I was abundantly paid for all the toil care I had with the Hand Cart Co. and my heart is full of gratitude to God that I have had embraced the privilege of coming with the 1st Hand Cart Com. (Oakley OTD). When we arrived in Immigration canyon we were met by Pres. Young and several members of the quorum of the twelve apostles. They arrived in wagons drawn by oxen and mules. We halted, they served us melons. Pres. Young told us to eat moderately of the mellon, to eat the pink, not to eat into the green. Father said he was quite sensible. My little sister, Annie, age four, had been promised a big piece of bread and butter when she should reach the valley. Just as we were lined up to hear a few words from Bro. Brigham Young, a lady held up a large piece of bread. Annie ran toward her. “That’s my piece of bread and butter,” she cried joyously. At the sight of this Pres. Young wept, “God bless the child,” said he. There were tears in the eyes of the people from the valley but there were only dry eyes among us who had just arrived. Pres. Young said he could defer his remarks until a little later. That afternoon we went down into Salt Lake Valley. We camped on the square in the sixteenth ward, remaining there from Friday night until Monday morning. Bro. Brigham Young came and spoke to us. He told us that we had fulfilled a prophecy. He also said that although we had endured privations and hunger on the plains we should never again feel the pangs of starvation if we would do right and live right. (Sabin OTD). great preparations were made by our company to salute Pres. B. Young and those with him by a tune from our Brass Band, and others sung the Hand Cart song--after which Pres. B. Young invited his company to bring out their bread and cheese, and be liberal with what they had. Said that they had come to meet, cheer, and congratulate us who would be the first of Pioneer Hand Cart Company into Salt Lake City, and who had come up through many tribulations. From here into the city we were piloted by the Salt Lake City Brass Band and our Band with them and camped in Union Square in front of Dimick Huntington's on the evening of 27th Sept. 1856. (Philips WMH). Monday Sept 22nd traveled hom to G. S. L. City 40 miles where I found all tolerable well; and soon after that, the first company of saints came in, that ever crossed the plains with handcarts, let by Edmond Elsworth. They were poor and needy, destitute of food and raiment, worn out with the journey and without homes but by the kindness of the saints they were all provided with comfortable homes in a few days. I took a girl of 13 years, Jane Stoddart. (Huntington, Oliver Boardman OTD). An abundant entrance and a royal welcome to this city were enjoyed by [Edmund] Ellsworth's and [Daniel] McArthur's companies, they being the first emigrants of any creed or nationality who crossed the plains with hand carts. On the 26th of September Governor B. Young, H. C. Kimball, D. H. Wells, and many other citizens in carriages, several gentlemen and ladies on horseback, with part of Captain H. B. Clawson's company of lancers, and the brass bands under Wm. Pitt, went to near the foot of the Little Mountain, and halted there. Governor Young and H. C. Kimball drove on to meet [Edmund] Ellsworth's company, and when they came up with it the emigrants were regaled with melons, during which [Daniel] McArthur's company came up. Thence to the public square in this city the following order of procession was observed: Lancers, ladies on horseback, Governor Young's, H. C. Kimball's and D. H. Wells' carriages, the bands, [Edmund] Ellsworth's and [Daniel] McArthur's companies, citizens in carriages and horseback. Before reaching the city, the procession was largely increased by men women and children on foot and on horseback. The procession reached the public square about sunset, and the emigrants were addressed by Governor Young. (Jacques, John OTD). The first two hand-cart companies arrived in the city last Friday evening, 26th. Since we received the news of their starting, they have been the universal topic of conversation; while at work or in leisure. I wonder where the hand-carts are? was on the end of every one's tongue. We heard various reports concerning them but nothing true till last Thursday when we heard they were within one day's march of the city. We heard they were going to winter at Fort Laramie, some said the reason they had not been seen was while the mail passed they had gone off the road to feed—others they had stampeeded: but last Thursday all doubt and uncertainty was at an end by a messenger coming in, stating they certainly would be in the next day. The excitement in the city on the 4th and the 24th of July, to my mind, was nothing in comparison to it. 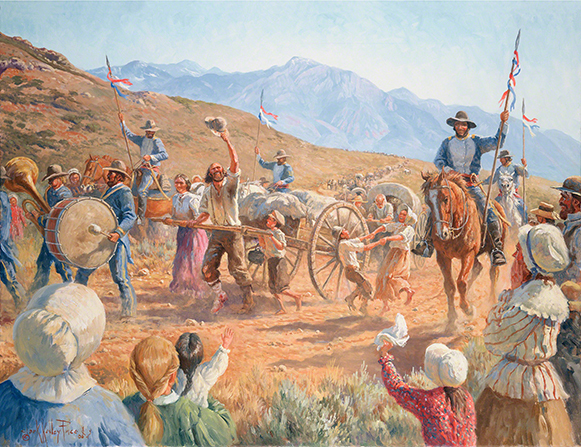 Presidents Brigham Young, and H. C. Kimball escorted by the minute men and a company of Lancers, followed by as many of the citizens as could turn out—some in vehicles and some on foot, with the two bands, to welcome the hand-carts and they did not forget to take them something to eat. President Brigham Young, and Kimball went part way up the little mountain in a buggy and met them coming down. Bro. Brigham was introduced to them as they formed in line, and he was so much affected with the spectacle, he could only say: My good people I am glad to see you, God bless you all. He hurried away, he could say no more. The Salt Lake Brethren then gave the emigrants plenty to eat and they once more went to their hand-carts and made the last start. As they came down the bench you could scarcely see them for the dust. When they entered the city, the folks came running from every quarter to get a glimpse of the long-looked-for hand-carts. If I had had time I should have gone as far as the foot of the little mountain, but I had not the time to spare, and so I was contented to meet them in the city by Brigham's house. Behind a row of wagons and carriages, came the hand-carts. I shall never forget the feeling that ran through my whole system as I caught the first sight of them. The first hand-cart was drawn by a man and his wife, they had a little flag on it, on which were the words: "Our President—may the unity of the Saints ever show the wisdom of his counsels." The next hand-cart was drawn by three young women. I did not take particular notice of the others, some were drawn by women some by men, in all amounting, I believe, to 50 hand-carts, and near 500 souls. I believe some 7 or 8 persons died on the road. The tears rolled down the cheek of many a man who you would have thought would not, could not, shed a tear; but the scene was exciting in the extreme and most everybody felt sympathetic and joyous. I could scare refrain from tears. Richard cried like a child, and amongst the women the crying was pretty near universal. I went down on the public square with the companies. Bro. Brigham spoke a few words and retired, requesting the Bishops of the several wards to first see that they did not want. In the morning of the next day, there was an abundance of provisions for them, and they sat down to a dinner provided for them by the Governor: the Nauvoo Brass and Capt. Ballo's Band playing all the time. There were hundreds of people on the Square all that day, and all day yesterday. The emigrants appeared in pretty good spirits, and I think in good health with a few exceptions. In a short time I have no doubt the Square will be as empty as ever; they will soon disperse, some to their friends, some to the country, some perchance will go back. The entrance of the two first hand-cart companies into G. S. L. City, will never be forgot by thousands. They outtravelled all the ox teams that left with them, and overtook and got in before a company of ox teams who are not yet in, under the Presidency of Eld. John Banks, who left 10 days before them, and they would have been in several days sooner, had they not been hindered in waiting for the ox teams they had with them. Yesterday I had once more the pleasure of listening to Bro. John Oakley, giving some account of his mission and his travels with the hand-cart companies as their rear guard; he looked as well as ever I saw him. I spoke to him on the Square last evening, he asked me how I like the place, desired me to do right and stick to Mormonism, which, by the help of God, I mean to do. Bro. Brigham said that he knew Bro. Oakley and the men who travelled with him were good men. I can assure you that to Bro. Oakley was a great consolation. (Treseder, Charles M. letter to The Mormon OTD). The main company arrived in Salt Lake City September 29 , 1859. Here we were met at the head of Emigration Canyon by President Brigham Young and a company of his scouts. The company was over two months making the journey from Council Bluffs, Iowa to Salt Lake Valley. (Butler FS). As they camped at Henefer (see, below) at 6:30 pm, the Weber crossing must have been shortly after leaving Echo Canyon. This would be where East Canyon Creek meets the Weber at Henefer. Exist Light! And Light Was.